Frame houses (as well as element or modular houses) are one of the most promising technologies for building summer houses and cottages. Today, it is also one of the world’s most popular technologies for low-rise construction. This is the main technology for low-rise construction in many developed countries: the U.S., Canada, Japan, Scandinavia, Finland, Germany, and others. In most countries, frame houses are built within the framework of national housing programs, as they are optimal in terms of price, quality, construction deadlines, and service life. The construction of frame houses foresees that parts of the low-rise building (walls, partitions, ceilings, roof panels, and other elements) are produced in accordance with the technical documentation and the production requirements. The walls of the frame house have a layered structure. The basis consists of a wooden frame made using planed sawn timber that has undergone a technical drying process and has a moisture content of 12-14%. Next, the frame is filled with non-combustible stone wool insulation. The insulation does not diminish in volume or lose its properties throughout its lifetime. The sufficient density of the frame prevents convection, thereby preventing heat transfer even during very cold winter months. Diffusion membrane covers the outside of the frame, which, due to its unique properties, ensures diffusion of water vapour but prevents moisture from being absorbed. The wall is then covered with a 12 mm thick cement-bonded particleboard (CBP). CBP is an environmentally friendly material. It does not contain phenol, formaldehyde, and other toxic compounds. The main chemical binder is cement. The CBP is made by pressing the molded mixture of coniferous wood chips, portland cement, minerals, and water. In addition to making the wooden frame extra stiff, the board also acts as protection against weathering. 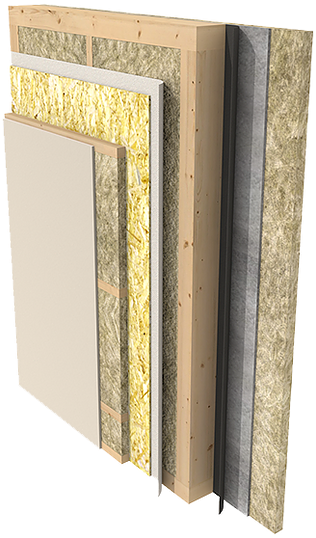 Upon request, an insulating layer will be applied to the CBP (for rendered facades) – a non-combustible 50 mm thick PAROC LINIO 20 board. The inside of the frame is vapour insulated to protect the insulation material, wooden frame, and other layers from moisture and condensate that build up due to the temperature differences inside and outside. In addition to steam insulation, an OSB-3 (10 mm) plate is installed, which gives the frame diagonal stiffness. A horizontal belt (45 x 45 mm aperture) with a 50 mm thick, horizontally directed thermal insulation is added to prevent cold bridges and to install communications. 12 mm thick gypsum plasterboard (GKBI) is used for internal finishing. The GKBI beats its competitors in terms of durability, practicality, fire safety, environmental friendliness, biological stability, and many other factors. The GKBI production technology eliminates the use of glues and resins in the composition, which ensures the best environmental friendliness and safety for human health. Finljus specialises in the production of energy-efficient buildings using the state-of-the-art technology, which requires assembly of buildings from ready-to-use elements. Construction elements (exterior walls, interior walls, ceilings, roof panels, etc.) are produced at the factory. The elements are then transported to the place of house installation and are installed on the foundation within 1-3 days. All elements are produced using modern materials and technologies that ensure energy efficiency. This allows the owner of the house to save significant amounts of money in terms of heating, air conditioning, and associated costs. For us, designing energy-efficient homes means finding and implementing the leading design and engineering solutions that help reduce operating costs throughout lifetime. Choosing our company, you choose a well-designed, high-quality energy-efficient home. As today’s energy efficiency is one of the main qualities of high-quality housing, it can be a major advantage when selling Finljus houses on the secondary market.